The NerdSense Mk.1 sensor is our second expansion device for the NerdCam3D Mk.1 or Mk.2 3D-FPV flight camera. It is a full replacement of the old ADC4OSD and from now on your best companion to get the most out of the camera's built-in stereoscopic OSD. The sensor basically measures voltage, current consumption as well as your RC-receiver's RSSI output signal and prepares these data for the 3D-camera. 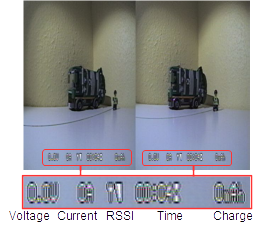 Out of this raw information the camera generates the stereoscopic OSD covering voltage (0 to 25.5V), current draw (0 to 100A), charge counter (0 to 9999 mAh), wall-clock (0 to 60 min) and RSSI bar display. Connect the sensor with the accompanying cable to the camera and the camera's OSD becomes activated automatically upon camera start-up. Use either PWM-RSSI or DC-RSSI raw signals from different RC-receivers with user-defined 0% and 100% RSSI thresholds. If RSSI is not necessary for your application, simply deactivate it with the sensor's on-board controls. Enjoy integrated RSSI signal conditioning with RC-filtering and user-defined amplification. This is how the stereoscopic OSD will look like for side-by-side 3D-mode. The complete information block is embedded twice into the video stream without introducing any latency. Notice the inwards offset of left and right block. This offset is necessary for the optimal 3D-convergence setting. The chosen offset value defines the virtual distance in which the OSD will float in front of you. The offset can be adjusted with the camera's trim potentiometer for best user experience. All these features are available for the alternative field-sequential 3D mode as well without any limitation. 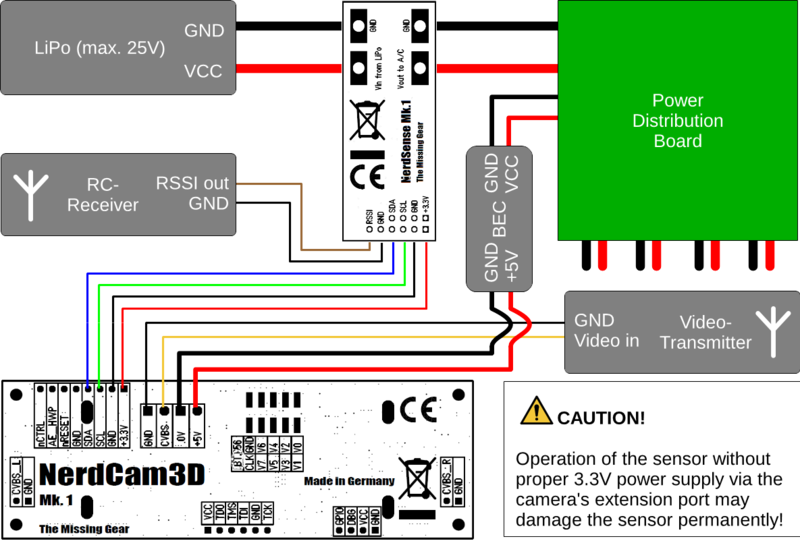 Attach the sensor to your camera and the other devices of your RC-vehicle like shown in this wiring diagram. Notice the safety advice. The NerdSense Mk.1 sensor will work with any firmware version of the NerdCam3D, however the number of displayed parameters is dependent on the actual firmware version. The following table summarizes those firmware versions currently in use and explains which OSD parameters are supported respectively. 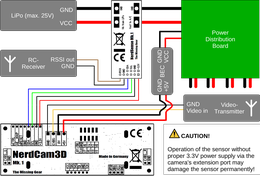 Any NerdCam3D 3D-camera with firmware version 2.1 can be updated with a newer firmware. For this, the 3D-camera must be sent to the manufacturer. If interested please contact us to arrange a firmware update. Updating the camera via the reseller network is unfortunately not possible at the moment. The RC-receiver's output voltage for 0% RSSI must be lower than the voltage corresponding to 100% RSSI. Please note the permitted voltage range of 0V to 3.3V DC at the RSSI input of the sensor in DC-RSSI mode. The pulse width of the RC-receiver's RSSI signal for 0% RSSI must be lower than the corresponding pulse width for 100% RSSI. Please note the maximum PWM signal magnitude of 5V DC at the RSSI input of the sensor in PWM-RSSI mode. The tapping of the RSSI signal from Futuba® FASST™ receivers has been described elsewhere (http://blog.flytron.com/rssi-output-for-2-4ghz-futaba-fasst.html or http://fpv-community.de/showthread.php?7271-Futaba-R617FS-RSSI-Signal). You only need to attach the wires as described in Flytron's blog on the RC-receiver. The mentioned SMD RC-filter is not necessary, as the NerdSense provides its own. Connect this raw signal to the RSSI-input of the NerdSense and don't forget to put it into PWM-mode. Then proceed with the RSSI calibration as outlined in the manual.